BELIZE CITY, Thurs. Nov. 30, 2017–Following a parliamentary caucus meeting yesterday evening, Leader of the Opposition (People’s United Party), Hon. John Briceño, said that if Prime Minister Dean Barrow cannot convince his Cabinet members to vote in favor of the motion for compliance with the 90-million-dollar CCJ (Caribbean Court of Justice) judgment in favor of the Belize Bank, then he should step down. 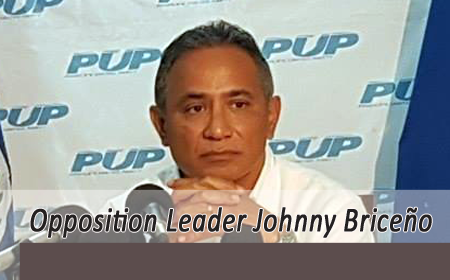 The PUP, however, have not as yet formulated a united position on the CCJ judgment. Briceño explained to reporters, “What we did today as a caucus, we met to discuss the issue in front of us, the matter of the 90-million-dollar judgment from the Caribbean Court of Justice, and we’re not at the point of making a decision as to whether it is going to be a ‘yes’ or a ‘no’ or whatever. We want to be able to get the facts, for us to get a proper understanding as to what has been taking place under the Barrow administration. Briceño was asked for his reaction to the Barrow administration’s position on the CCJ judgment, that it may not pay the judgment debt. Briceño was also asked if he would allow his parliamentarians to vote based on their conscience, as the Prime Minister indicated his ministers would be allowed to do. “Well, that is a cop out. That’s the coward’s way, because we are in this situation today because Prime Minister Barrow, because of his spitefulness, his vindictiveness and his bad-mindedness, decided that he was going to undo a settlement,” Briceño responded.